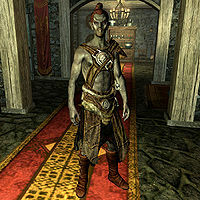 Athis, a Dunmer warrior, is a member of the Companions living in Jorrvaskr within the city of Whiterun. When you enter Jorrvaskr for the first time, you will find Athis engaged in a brawl with Njada Stonearm, a fight that he always loses. He's adept in one-handed combat and will offer expert-level training in it up to level 75, if you are a member of the Companions. He keeps quiet most of the time, but will not tolerate repeating himself. He is civil and loyal, but never at the forefront of any battles. Athis wakes at 6am and heads to the main hall to eat breakfast and wander around until 7am. He then heads outside to the training area where he'll socialize, drink, and watch people until noon, then goes downstairs to the Living Quarters to eat lunch. Around 1pm, he'll take to wandering around the main hall again. At 4pm, he'll go back down into the Living Quarters and walk around until 8pm before going to bed. Once the Companions questline is completed, Athis can become a follower, a new member of the Blades, and a candidate for marriage. If you ask Athis who is in charge, he'll reply, "Soon enough, it'll be me. In the meanwhile, the Circle handles our daily routine, and Kodlak advises them as Harbinger." If you ask why he joined the Companions, he'll answer, "Fortune and glory, friend. Fortune and glory." Asking him who the Companions are will result in Athis responding, "Why would you even come to Jorrvaskr without knowing what we stand for? This is not play-acting, here. We are the true spirit of Skyrim. Honor is in our blood, death in our hearts. If you seek either, you've found the right place." If you walk past or start a conversation with him as a Dunmer, he'll say, "We are all Ashlanders now, brother/sister. Good to find another family that cares where they came from, eh?" After you join the Companions, you can ask him what it means to be one of them. The first time you ask, Athis will say "It means signing on for the Nord ideas of how to live your life. Honor, battle, glory, all that. "Even an elf can be born with the heart of a Nord," Skjor said when I joined. I think he meant it as a compliment." Thereafter, when asked the same question, he will say "To me, it means not having to answer foolish questions a second time." After the quest Blood's Honor, Athis will be found lying wounded on the floor of Jorrvaskr. Although his default gear is governed by the Light Armor skill, Athis is actually more proficient in heavy armor. This issue has been addressed by version 2.0.9 of the Unofficial Skyrim Patch; his class has been given proficiency in Light Armor, since it's unique to him. Like many named Whiterun NPCs, Athis may attack you on sight for no apparent reason. Commit a minor crime in front of a Whiterun guard, such as assault, then clear the resulting bounty. This should clear Athis' hostility, even in mid-combat. Open the console, select Athis by clicking on him or entering the code prid 1a6d6, then enter the code setav aggression 0. Note that this only works if Athis isn't currently in combat with you.